Did you know that Repetitive Strain Injuries (RSI’s) are the nation’s most costly occupational health problem and that they affect hundreds of thousands of workers a year? The average annual cost spent on these types of injuries is $20 Billion Dollars! The problem with a lot of 21st century jobs, is that most of them take place in front of a computer. Even my job as a physical therapist requires several hours a day in front of a computer completing paperwork on my electronic documentation system or updating this blog. And computers require very little task variation. Most computer users stay in their chairs and type/perform mouse work for prolonged hours. This forces a few isolated muscles to activate repeatedly to accomplish a task like holding the head up to focus on the screen, moving the fingers to type, or moving the wrist to mouse. 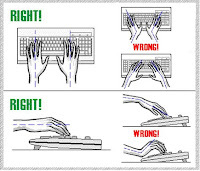 The repeated motions involved in typing or mousing can cause tendon and tendon sheath injuries, especially if the wrist or hand is in poor position during these activities. A poorly designed computer workstation may also increase fatigue to any of the muscles in the upper extremity (forearm/elbow/shoulder) and irritate any of those muscles or tendons as well. To simplify things for you, just remember that you always want to maintain good posture. And that means straight wrists, elbows close to the body, and head straight and in-line with the torso. 1) Do not bend or twist your neck when looking at the monitor. Try to keep everything straight in front of you. 3) Try to avoid reaching when mousing or typing. Try to keep elbow to your side and close to your body when doing these activities. Try to keep the mouse and keyboard at approximately the same height. 4) Try to keep forearms parallel to the floor and your wrists should be kept in a straight line with your forearms. Angling the wrist up or down while typing or mousing is bad and contribute to wrist tendinitis or carpal tunnel syndrome. 5) Try to keep your thighs parallel to the floor and your feet should resting flat on the floor. If you’re sitting too far forward in your chair or your feet do not touch the floor, this can increase stress to your low back with long periods of sitting. 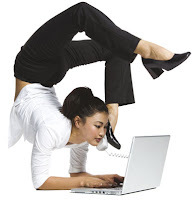 In addition to properly setting up your workstation, there are two things that can help reduce repetition and decrease the likelihood of repetitive stress injuries: 1) Task Rotation or Job Enlargement – Manage your job and mix tasks so that you don’t do the same job for a prolonged period of time and 2) Micro Breaks or Rest Pauses – Make it a habit to take short rest breaks to stretch your wrist and forearms, drink some water, and walk a little ways to get circulation to your legs. If you need more help about properly setting up your workstation or preventing repetitive strain injuries, you can consult your company’s human resources department to see if they have a certified ergonomics specialist they could recommend. Feel free to contact us as well at Elite Sports Physical Therapy. Taking care of your body now, means much less pain in your future.